The Winter Meetings came and went, and so, too, did a few of the potential bullpen options. The Yankees are still on the hunt for a couple of relievers to replace the free agent duo of Zach Britton and David Robertson – both of whom are still available as of this writing, and both of whom were written about in our season reviews – and, as per Brian Cashman himself, it remains a priority. I’ve already written about Kelvin Herrera, Andrew Miller, Adam Ottavino, Jeurys Familia (who later signed with the Mets for 3-years, $30 MM), Cody Allen, Greg Holland, and Ryan Madson. With the Yankees potential budget restrictions being what they are (or might be), I’ll pivot to some middle relief options to bolster the … well … middle innings. Yankees fans are familiar with Brach, who pitched for the Orioles from 2014 through this past trade deadline, and has faced the good guys 25 times in his career. He wasn’t terribly effective, though, pitching to a 5.32 ERA in 23.2 IP – but I digress. 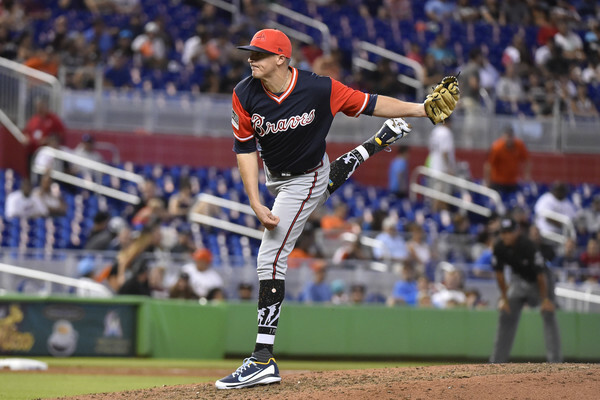 Brach has been a rock-solid reliever for seven years now, pitching to a 3.05 ERA (133 ERA+) and 3.69 FIP in 449 IP since coming to the majors for good in 2012; and that includes a 2.99 ERA (140 ERA+) in 327.2 IP in the AL East. And that’s something that we’ve seen the Yankees value in the past, notably with the aforementioned Happ. What the heck happened? The easiest explanation is that the Orioles are awful, and everyone on the team felt it. Their porous defense led to a .371 BABIP when Brach was on the mound (his career BABIP is .284), and his batted-ball profile doesn’t suggest that he was giving up better contact than before. His hard-hit percentage was up a bit – but his soft-hit percentage was, too. His HR/9 (0.92) and HR/FB (10.0%) were in-line with career norms, as well. So what about his velocity? 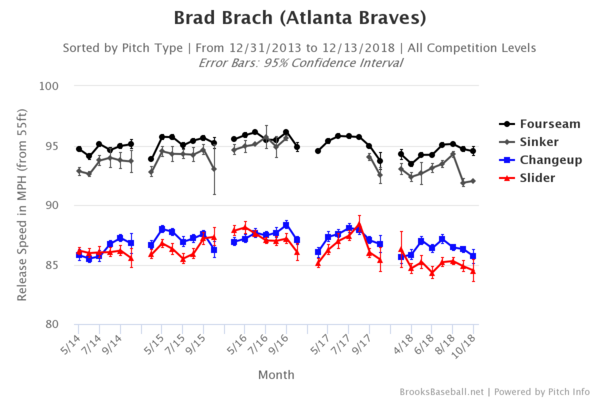 Brach’s fastball did tick down this year, particularly in the first half. It returned to normal after the trade, though, which may suggest any number of things. A hidden injury? A slump? The malaise of being an Oriole? Who knows. But he returned to form with Atlanta, much as Britton did with the Yankees. I don’t want to discount the potential of a slip in velocity going forward, though, as Brach will be 33 shortly after opening day. But I think he’s in-line for a bounceback. MLBTR forecasts a 2-year, $12 MM deal for Brach, and that seems reasonable to me. He has some closer experience, filling in for Britton in 2017 and part of 2018, but he’s largely been a middle reliever or set-up man otherwise, and I suspect that’s how teams view him. And, at that cost, I think he makes quite a bit of sense for the Yankees. Let’s get a few things out of the way first: Perez is a 37-year-old journeyman that had to wait until June to find a team because he was ineffective at best in 2016 and 2017, and his best role is as a lefty specialist. And, yes, 2018 was far and away his best season. Now, that being said: Perez was an excellent specialist last year. He held lefties to a .191/.214/.274 slash line, which is actually a tick better than he was prior to his two-years of struggle (lefties hit .185/.235/.283 against him in 2015, for example). And he was solid against lefties in those interim years, too; the greatest issue was that he faced a fair amount of righties, and they have murdered him over the last several years. He’s a specialist, through and through. So is there anything that supports this being for real? Yes, actually: his pitch selection. Perez all but eliminated his sinker (his worst pitch by a considerable margin in 2016 and 2017) in favor of more four-seamers and more sliders, and it paid dividends. Perhaps due to his focusing on two pitches instead of three, the spin rates on his four-seamer (from 2099 RPM to 2156) and slider (2110 to 2308) increased markedly, and both were more difficult for hitters to square-up as a result. 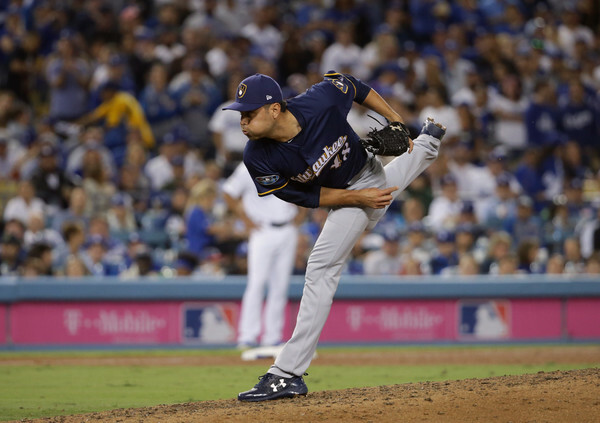 The combination of pitch selection and those pitches having more movement suggests that this wasn’t just luck; and it may even portend a reason to expect something closer to vintage Perez in 2019. 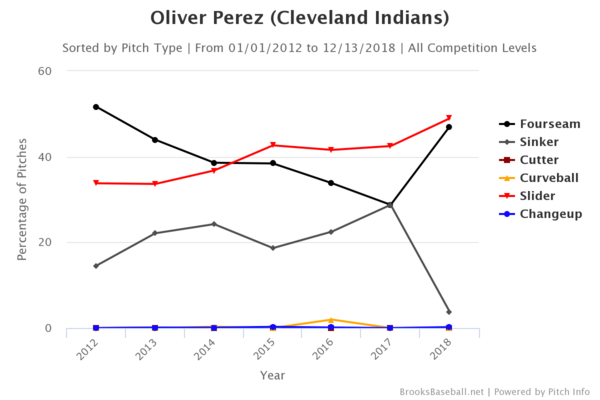 There aren’t really any contract predictions out there for Perez, and I suspect that his market won’t be terribly hot anytime soon. But if the Yankees do turn to a specialist, that lack of interest could result in a bargain. Ouch. Romo’s effectiveness dropped off across the board, and it seemed as though every batted ball was hit in the air; and the result of that was five home runs allowed in those nine innings. He had his ups and downs throughout the season, but he has never been as bad as he was in September. 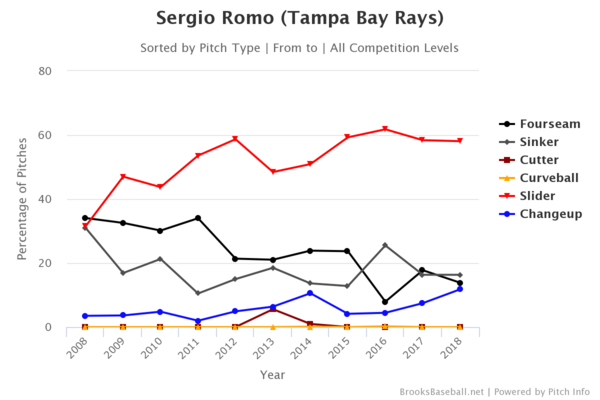 Romo’s anti-fastball approach and year and a half of (mostly) very good performance in the AL East makes him appealing to some extent; and the fact that his market isn’t projected to be all that large helps, too. However, he’ll be 36 in March, and he’s always been a flyball pitcher. And, even with his great slider, it’s hard for me to see a RHP succeeding in Yankee Stadium with a fastball that sits between 87 and 88 MPH, as his has for the last three years. As a result of this, I wouldn’t say that Romo’s a straight-up no for me – but his name value and upside doesn’t quite jibe with the reality of the Yankees situation. In terms of their story arcs over the last few years, Sipp and Perez are quite similar. 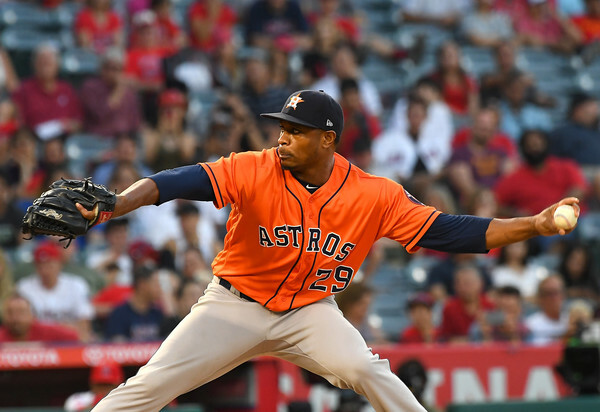 Sipp never struggled to find a job due to his contract with the Astros, but he bounced back from abysmal 2016 and 2017 seasons to be as dominant as ever (if not more so) in his role in 2018. From 2011 through 2015, Sipp held lefties to a .210/.283/.369 slash line; in 2018, it was .188/.263/.294. In between, lefties hit .264/.335/.540. And, on the off-chance that this needs to be said, that’s simply unacceptable. Sipp’s velocity was dipped noticeably in 2016 and 2017, and regained nearly a full MPH last season. Moreover, he had largely shelved his four-seamer in 2016 and 2017 (roughly 35.7% of his offerings), before going back to it (53.3%) in 2018. It’s worth noting that his fastball has been a plus offering (by FanGraphs’s run values) throughout his career, but was deep into the red in 2016 and 2017. The spin rate remained steady, per Statcast, so maybe it did just come down to velocity. 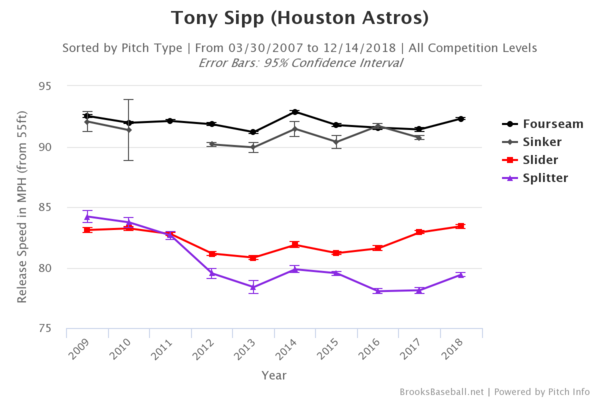 Regardless, Sipp is another reliever that doesn’t figure to be in big-time demand. If the Yankees want a lefty specialist, Sipp fits the bill. I do think I’d prefer Perez, though, if only because his pitches – in terms of velocity and spin – jump off the page more. Soria is a name that is brought up around every Rule 5 Draft, as one of the biggest success stories from what has largely been an uneventful process. 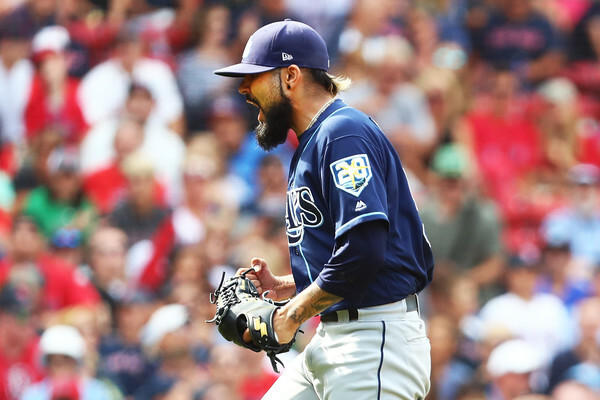 The Royals snagged him from the Padres organization way back in 2006, and he has gone on to rack-up 634.1 innings of 2.88 ERA (148 ERA+) with 220 saves and great peripherals over an eleven year career. That was a long time ago, though, and Soria is entering his age-35 season. So what sort of pitcher is he now? 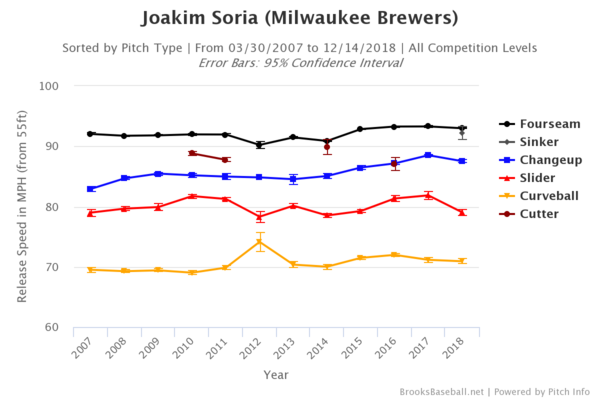 As you can see from the numbers above, Soria was excellent last year; both his strikeout and walk rates were better than his career norms, and comfortably better than league-average. It’s kind of beautiful, isn’t it? Soria’s also the rare reliever that mixes in more than two pitches. He was a fastball-heavy guy in 2018 (66.4%), but he threw his change-up, slider, and curve right around 10% of the time apiece. It’s enough to keep hitters guessing and, along with his arm slots, that’s probably why each pitch had at least a 25% whiff per swing rate. 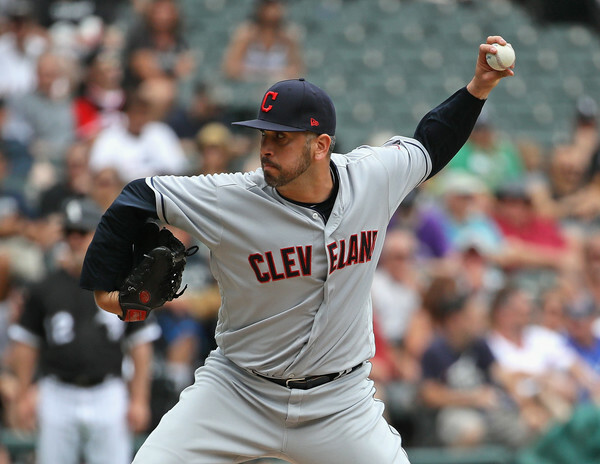 MLBTR projects a 2-year, $18 MM deal for Soria, and I can definitely see that happening. In fact, I could see him doing a bit better now that I’ve dug into his numbers a bit more. And at 2-years, $18 MM, I’d be pleased to see him in pinstripes. He’s still a stud.